In just four years of operation, Southern Cotton Pty Ltd has quickly grown to become one of the top cotton ginning facilities in all of Australia on the strength of its award-winning business practices. The company has already processed over 700,000 bales of cotton, and is highly respected industry-wide for taking a leadership role in developing the cotton industry throughout southern New South Wales. Southern Cotton’s excellence was recently recognised by the prestigious Telstra Australian Regional Business Award they picked up at the 2015 National Telstra Business Awards, providing solid proof that the company’s early success was no beginner’s luck. Located in the Murrumbidgee Irrigation Area (MIA), Southern Cotton was the brainchild of six local growers who were fed up with having to commute 400 kilometres to have their cotton ginned, which was not only time consuming and labour intensive, but also very expensive. Those six friends – now the directors of Southern Cotton – decided to team up to provide a better solution for the local market, and in 2011, the company was born. Astonishingly, the directors managed to locate a greenfield site, secure the finances, acquire the necessary approvals, hire qualified staff and build a $25 million ginning facility in under 12 months. That amazing feat was outdone the moment Southern Cotton opened its doors, as the company set a record for first-year gins by processing more than 166,000 bales of cotton. That immediate success can be attributed in large part to the company’s first-class systems and equipment, which have continued to improve with each passing year. 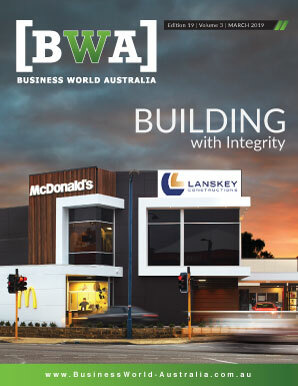 They have also been extremely successful in building their brand throughout southern NSW, particularly through effective marketing strategies and an active social media presence. General Manager Kate O’Callaghan is the architect behind Southern Cotton’s award-winning business structure. After obtaining a Bachelor of Science degree in Agriculture from the University of Sydney, Kate started her career working with farmers in irrigated pasture research. Ten years later, when the Department of Agriculture discontinued that research program, she took on a role as a Production Agronomist in the field of hormone replacement therapy with Novogen. “It was an amazing opportunity at a greenfield site to use all my previous work experience to not only build a business from scratch, but also build the relationships with the growers from scratch, and even help develop the industry as a whole because it was sort of in its infancy at the time,” she recalls. With Kate onboard, Southern Cotton was able to quickly fulfill its vision of providing local growers with a speedy, high-quality ginning service at an affordable price to help them achieve the best returns on their investment, and subsequently, increase the viability of cotton as an alternative crop. The company has undoubtedly accomplished that, as land area dedicated to the cotton industry throughout the MIA has tripled since its inception. According to Kate, that’s just a by-product of offering a complete service. 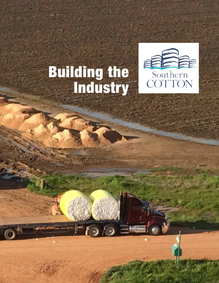 Southern Cotton goes above and beyond to meet the individual needs of each customer, whether that’s by providing prompt turnover times, in-depth reporting, or even assistance in dealing with logistical or insurance-related issues. However, it’s the company’s best business practices that truly take its service offering to the next level. Southern Cotton boasts a number of external accreditations covering “99 to 100 per cent” of the ginning process, ranging from equipment calibration and moisture content management all the way through to the presentation of the finished product. Those best business practices, combined with a full suite of services and dedication to growing the cotton trade throughout the region, have helped turn Southern Cotton into an industry juggernaut whose name is synonymous with excellence. Building the industry also includes educating the general public. Southern Cotton hosts hundreds of visitors each year to show them the tricks of the trade, as well as to inform them of the benefits of cotton farming. Southern Cotton also supports the local economy by partnering with regional suppliers and contractors at every opportunity. Kate says that helping your neighbours is a very common theme throughout the cotton industry, where you’ll often find competitors working together like a team and assisting one another unconditionally. Since forming just four years ago, Southern Cotton has already managed to pick up more than ten industry accolades, each pertaining to its outstanding business practices. The company’s awards success recently reached new heights when they won their first national award: the highly-coveted Telstra Australian Regional Business Award. Southern Cotton topped the other state winners representing their own regions at the 2015 National Telstra Business Awards after winning out the same category at the New South Wales Regional Business Awards. Judges cited the company’s surfeit of industry-leading systems, state-of-the-art technologies and innovative marketing strategies as the deciding factors in crowning Southern Cotton national champions. It’s also not a bad result for a young company that was simply looking to benchmark its systems and practices against other established businesses across the country. Southern Cotton now looks to repeat that success in a new calendar year. Kate says the company’s agenda for 2016 includes a strong emphasis on continuing to grow the cotton industry throughout the MIA – an upward trend that has already reached 46,000 hectares of land area dedicated to cotton growing in the region, up 10,000 hectares from the previous year. 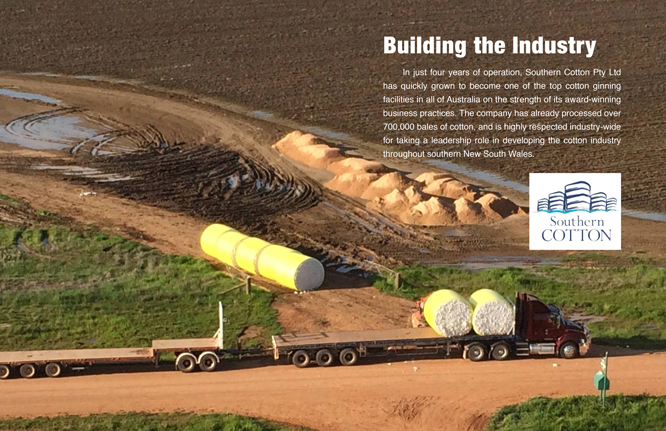 In addition to supporting local growers, Southern Cotton’s future plans include the potential diversification into storing finished product and providing value-added services to their customers, whilst further fine-tuning their industry-leading best business practices and systems in the process. “So there’s still more work we can do within our business to take it up another step, and absolutely every year we’re going to take it up another step,” Kate concludes.